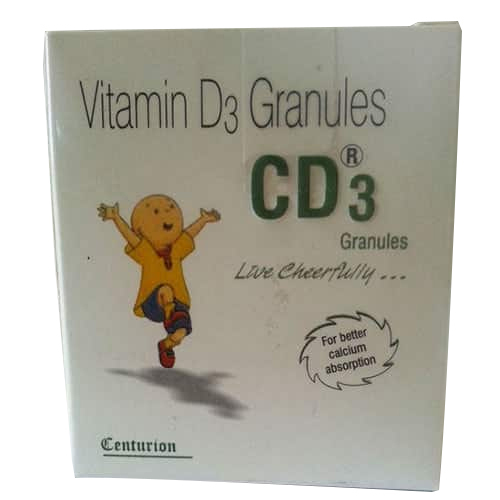 With rich market knowledge as well as experience, we have been able to emerge as a trusted organization engaged in offering Vitamin D3 Granules. These granules are formulated under the firm guidance of expert physicians using optimum quality compounds and ingredients. These granules help the body to get the optimum amount of calcium and phosphorus. Ideal for better calcium absorption, Vitamin D3 Granules are used to treat and prevent bone disorders. We offer these granules at reasonable prices. Backed by the experience of the industry, we, “Centurion Laboratories”, established in the year 2006, are acknowledged as a trustworthy manufacturer and exporter of Pharmaceutical Drugs. The range we deal in is inclusive of Allopathic Medicines, Erectile Dysfunction Medicines, Antiseptic Ointments, Antibacterials and Antibiotics, Anti T.B. Medicines and Cardiovascular Medicines etc. Offered range of medicines is formulated under the supervision of experts, who strictly follow the set norms and guidelines of industry. With an aim to offer quality-proven medicines to the clients, our quality controllers stringently examine these on various parameters, before the final dispatch. Most of our offered products are recommended to be taken after doctor's advice. We have developed a sound and sophisticated infrastructure, which is sprawling over an area of 4000 sq. mt. This facility is armed with all the essential technology and machines that are required for a smooth and planned production. With an aim to maintain hassle-free production process and higher production rate, we calibrate and upgrade all the these machines and techniques on regular time interval. Along with this, we have appointed a team of diligent and dexterous professionals who carry out the trade activities. These experts maintain highest quality standards of the pharmaceutical drugs manufactured by us and and also ensure timely delivery of these products to the customers' disposal. In order to ease the financial dealings, we also accept payment via cash, cheque and demand draft. Owing to the striven efforts of our employees, advanced processing facilities and transparent business policies, we have been able to create a niche for ourselves in the market.